There is a worldwide drive for the home management of chronic respiratory diseases. With the widespread use of home intravenous (IV) treatment for cystic fibrosis (CF) pulmonary exacerbations (PExs), evidence pointing to an inferior outcome of care for home-treated patients in comparison to hospital-treated patients is a cause of concern. Currently, patients who self-administer IV antibiotics at home are provided with equipment and instructions on the use of antibiotics. Policies vary; but in most UK centers, these patients are then followed up by the multidisciplinary team only on days 1, 7 and 14 of the treatment course. We aimed to review the current published literature in search for evidence for the value and the shortfalls of self-administered IV treatment at home for acute PExs in CF patients in comparison to conventional hospital treatment. We searched the electronic database system Medline for published papers regarding studies comparing home- and hospital-based IV antibiotic treatment for both adult and pediatric CF patients. Sixteen studies were identified and grouped into those that showed a similar outcome between home and hospital treatment and those that showed an inferior outcome for home management. Most studies were retrospective or inadequately powered to provide clear answers. Ideally, outcome of care for home treatment should be at least equal to outcome for hospital treatment. Extensive efforts should be made to standardize therapies preserving the advantages of home management and addressing the perceived reasons for an inferior outcome. Until further studies provide definitive answers, treatment at home should be reserved for adequately selected patients and individualized depending on the unique settings of each CF center and specific patients' requirements. There is great need for a prospective randomized controlled trial comparing home and hospital treatments in order to clarify this matter. 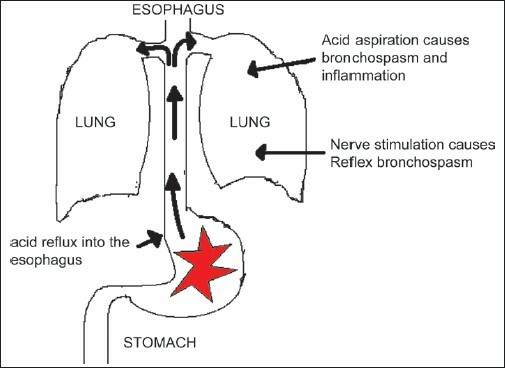 Gastroesophageal reflux disease (GERD) may cause, trigger or exacerbate many pulmonary diseases. The physiological link between GERD and pulmonary disease has been extensively studied in chronic cough and asthma. A primary care physician often encounters patients with extra esophageal manifestations of GERD in the absence of heartburn. Patients may present with symptoms involving the pulmonary system; noncardiac chest pain; and ear, nose and throat disorders. Local irritation in the esophagus can cause symptoms that vary from indigestion, like chest discomfort and abdominal pain, to coughing and wheezing. If the gastric acid reaches the back of the throat, it may cause a bitter taste in the mouth and/or aspiration of the gastric acid into the lungs. The acid can cause throat irritation, postnasal drip and hoarseness, as well as recurrent cough, chest congestion and lung inflammation leading to asthma and/or bronchitis/ pneumonia. This clinical review examines the potential pathophysiological mechanisms of pulmonary manifestations of GERD. It also reviews relevant clinical information concerning GERD-related chronic cough and asthma. Finally, a potential management strategy for GERD in pulmonary patients is discussed. Background : In patients with congenital heart disease undergoing cardiac catheterization for hemodynamic purposes, parameter estimation by the indirect Fick method using a single predicted value of oxygen consumption has been a matter of criticism. Objective : We developed a computer-based routine for rapid estimation of replicate hemodynamic parameters using multiple predicted values of oxygen consumption. Materials and Methods : Using Microsoft® Excel facilities, we constructed a matrix containing 5 models (equations) for prediction of oxygen consumption, and all additional formulas needed to obtain replicate estimates of hemodynamic parameters. Results : By entering data from 65 patients with ventricular septal defects, aged 1 month to 8 years, it was possible to obtain multiple predictions for oxygen consumption, with clear between-age groups ( P <.001) and between-methods ( P <.001) differences. Using these predictions in the individual patient, it was possible to obtain the upper and lower limits of a likely range for any given parameter, which made estimation more realistic. Conclusion : The organized matrix allows for rapid obtainment of replicate parameter estimates, without error due to exhaustive calculations. Background: The Modified Medical Research Council (MMRC) scale, baseline dyspnea index (BDI) and the oxygen cost diagram (OCD) are widely used tools for evaluation of limitation of activities due to dyspnea in patients with chronic obstructive pulmonary disease (COPD). There is, however, limited information on how these relate with each other and with multiple parameters of physiological impairment. Objectives: To study the interrelationships between MMRC, BDI and OCD scales of dyspnea and their correlation with multiple measures of physiological impairment. Materials and Methods: A retrospective analysis of pooled data of 88 male patients with COPD (GOLD stages II, III and IV) was carried out. Dyspnea was evaluated using the MMRC, BDI and OCD scales. Physiological impairment was assessed by spirometry (FVC % predicted and FEV 1 % predicted), arterial blood gas (ABG) analysis and measurement of the 6-min walk distance (6MWD). 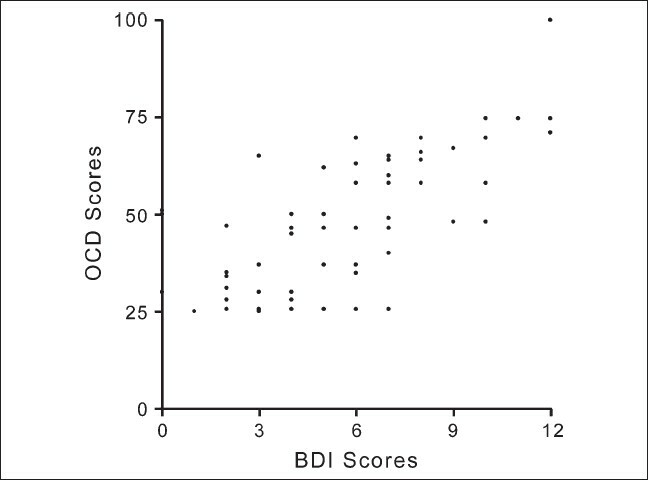 Results: The interrelationships between MMRC, BDI and OCD scales were moderately strong. The BDI and OCD scores had strong correlations with ABG abnormalities, weak correlations with spirometric parameters but none with 6MWD. MMRC grades were significantly associated with BDI and OCD scores but did not show clear associations with spirometric parameters, ABG abnormalities and 6MWD. Conclusions: The MMRC grades of dyspnea and the BDI and OCD scales are moderately interrelated. While the BDI and OCD scales have significant associations with parameters of physiological impairment, the MMRC scale does not. Objectives: To evaluate and compare the clinical and the pathological characteristics of antrochoanal polyps (ACPS) in adults and children. Materials and methods: Medical records of 35 patients (19 children, 16 adults) operated upon for ACPS between 1995 and 2005 at an academic tertiary center were reviewed retrospectively. Demographic characteristics, clinical presentation, surgical management, histological findings and recurrence rate were compared. Results: Of the 35 patients, 19 (54%) were children (mean age, 12.6 years) and 16 (46%) were adults (mean age, 31.4 years). Nasal obstruction was the most common presenting symptom in both groups. The incidence of snoring and/or obstructive sleep apnea was statistically significant, more common among the pediatric age group as compared to the adult group ( P =.001). Epistaxis was also found to be more common among the pediatric age group ( P =.027), while sinusitis was noted to be significantly more common among the adult group ( P =.019).Transnasal endoscopic removal of ACPS was performed in 12 (63.1%) children and 11 (68.7%) adults. A combined open/endoscopic approach was required in 36.9% of children and 31.3% of adults. On histologic examination, allergic ACPS (the mucosal surface is respiratory epithelium, no mucus glands, abundant eosinophils) was more common than inflammatory ACPS (the mucosal surface is respiratory epithelium, no mucus glands, abundant neutrophils) in children (2.8:1) as compared to adults (0.8:1) ( P =.045). All of our patients were followed with endoscopic examination for a period ranging from 9 to 42 months (mean, 24 months). Recurrence of ACPS was identified in 2 children and 1 adult. Conclusion: Antrochoanal polyps are a rare clinical entity. Children have unique clinical and pathological features as compared to adults. Endoscopic excision is safe and effective in the pediatric age group and has the capability to ensure complete removal and lower recurrence rate. Background: Heart manipulation during off-pump coronary artery bypass surgery may cause hemodynamic instability, and temporary coronary arterial occlusion may lead to myocardial ischemia. To reduce this, perioperative β -blocking agents or calcium antagonists can be administrated. The effects of perioperative administration of magnesium on myocardial function were studied in patients undergoing coronary artery bypass grafting. Objective: The aim of the study was to evaluate the effects of preoperative magnesium administration on perioperative hemodynamia, ventricular arrhythmias and myocardial protection. Materials and Methods: We reviewed 2 groups of patients undergoing off-pump coronary artery bypass surgery - 24 patients (control group) that had not received preoperative intravenous infusion of magnesium and 23 patients (treatment group) that had received preoperative intravenous magnesium sulfate. Results: The results demonstrated that it had reduced the heart rate, changes of ST segments, the need of β -blocking agents and the use of intra-operative intra-aortic balloon pump and the inotropic usage. Conclusion: This treatment may provide hemodynamic optimization during off-pump coronary artery bypass. Background: Primary mediastinal malignancies are uncommon. They can originate from any mediastinal organ or tissue but most commonly arise from thymic, neurogenic, lymphatic, germinal or mesenchymal tissues. Objectives: The aim of this study was to review the clinical presentations, diagnostic methods adopted, the histologies and the treatment outcomes of this rare subset of tumors. Materials and Methods: Case records of 91 patients in the period 1993-2006 at our institute were retrospectively analyzed. Patients with primary mediastinal mass and supraclavicular nodes were included for the analysis. Patients with primary, extrathoracic disease of the lung and peripheral adenopathy were excluded. Actuarial method was used for calculating the disease-free survival and overall survival. Results: Primary mediastinal tumors were seen commonly in males with mean age of 37.48 ± 17.04 years. As many as 97% of patients were symptomatic at presentation. Superior venacaval obstruction (SVCO) was seen in 28% of the patients. As many as 50% of the patients were diagnosed by a fine-needle aspiration or Trucut biopsy, while 28% of the patients required thoracotomy for a diagnosis. Majority of the tumors had anterior mediastinal presentation. Pleural effusion was seen in 20% of the patients, but diagnosis was obtained in only 1%. In adults, thymoma (39%), lymphoma (30%) and germ cell tumor (15%) were the common tumors. In the pediatric population, lymphoma, PNET and neuroblastoma were the common tumors. The 5-year DFS and OS are 50% and 55%, respectively. Conclusion: Primary mediastinal tumors are a challenge to the treating physician because of their unique presentation in the form of medical emergencies, like superior venacaval obstruction and stridor. Diagnosis may require invasive procedures like thoracotomy. 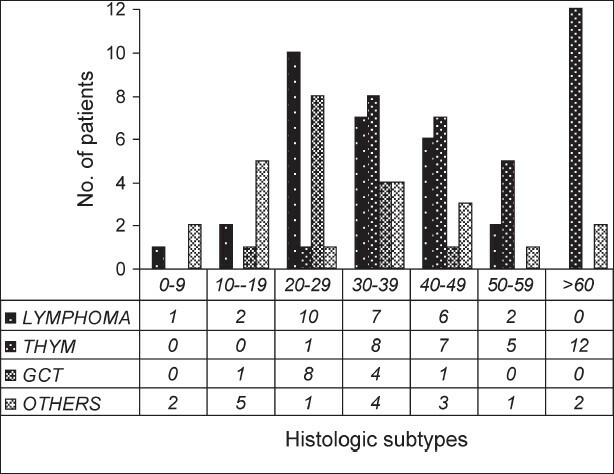 Treatment and outcome depend on the histologic subtypes. Pneumorrhachis (PR), or epidural emphysema, denotes the presence of air in the spinal epidural space. It can be associated with a variety of etiologies, including trauma; recent iatrogenic manipulations during surgical, anesthesiological and diagnostic interventions; malignancy and its associated therapy. It usually represents an asymptomatic epiphenomenon but also can be symptomatic by itself as well as by its underlying pathology. The pathogenesis and etiology of PR are varied and can sometimes be a diagnostic challenge. As such, there are no standard guidelines for the management of symptomatic PR, and its treatment is often individualized. Frequently, multidisciplinary approach and regimes are required for its management. PR associated with bronchial asthma is extremely rare, and only very few cases are reported in the literature. 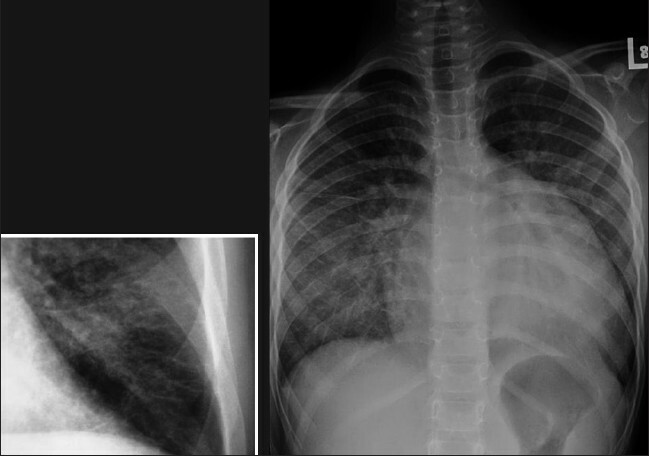 Here, we report a case of a 17-year-old Saudi male patient who is a known case of bronchial asthma; he presented with extensive subcutaneous emphysema, pneumomediastinum, pneumopericardium and pneumorrhachis as complications of an acute exacerbation of his primary ailment. Desmoid tumors are soft-tissue neoplasms arising from fascial or musculo-aponeurotic structures. Most reported thoracic desmoid tumors originate from the chest wall. However, intrathoracic desmoid tumors are rare. 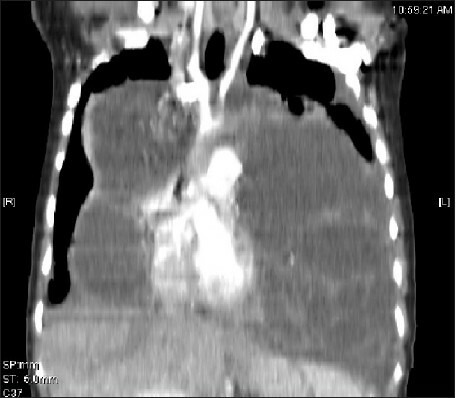 We present a case of a 35-year-old male patient complaining of mild shortness of breath. 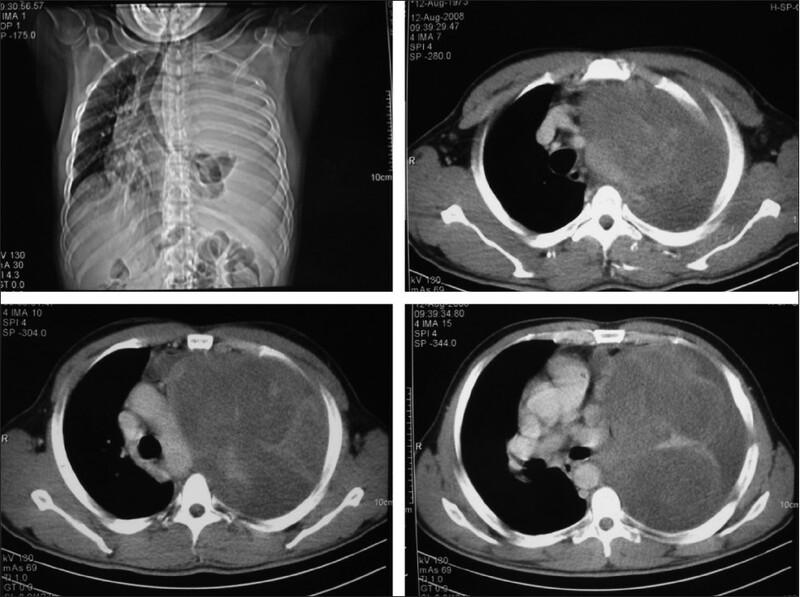 The patient was diagnosed to have a huge intrathoracic desmoid tumor, which was successfully resected. This is part II of two series review of reading chest radiographs in the critically ill. 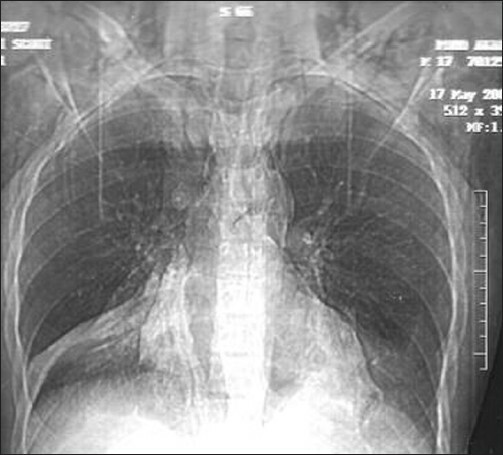 Conventional chest radiography remains the cornerstone of day to day management of the critically ill occasionally supplemented by computed tomography or ultrasound for specific indications. In this second review we discuss radiographic findings of cardiopulmonary disorders common in the intensive care patient and suggest guidelines for interpretation based not only on imaging but also on the pathophysiology and clinical grounds.